There are 4 ways to get involved this year! You can choose which option works best for you or elect to participate in all 4 opportunities! You can register for each individually HERE. Black Out Day is an annual event to advocate for a culture shift around alcohol use and abuse on campus. Each year, this is always done right before Halloween which is proven to be a high risk time for alcohol consumption on campus. (Tremblay, et al. 2010; Greenbaum et al., 2005; Del Boca et al., 2004) Since this is a high risk time, there are multiple ways to get involved and advocate for a safer community. To register for any aspect of Black Out Day: complete this form. The first 100 participants who register for Black Out Day will recieve a Black Out Day T-shirt. Often, participants stay silent to honor a loved one they have lost. While remaining silent and not speaking with their voice throughout the day, participants will use the day to become extremely vocal in other ways including a Social Media Take-Over sharing educational information for the community. 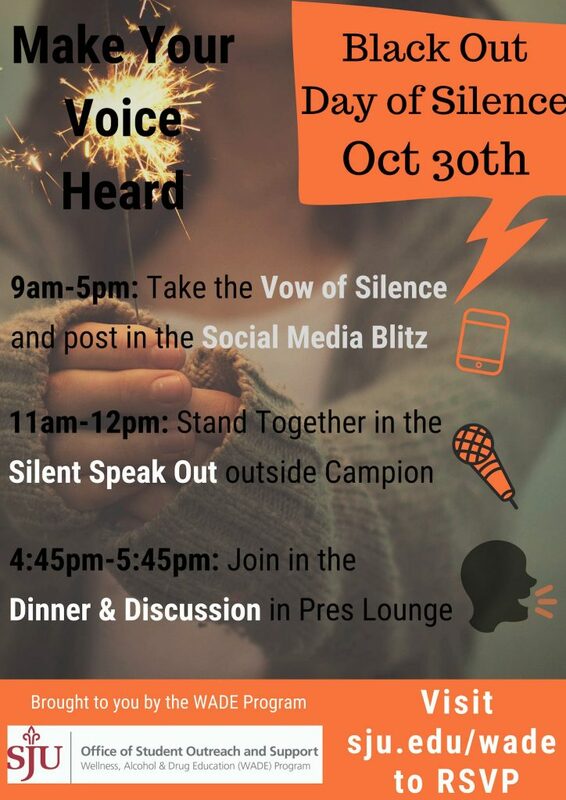 Those participating in the silence, and the entire community, are invited to gather for a Silent Speak Out outside of Campion during free period. Our collective silence will attract attention and raise the voices of those impacted by alcohol in our community. The Countdown to breaking the silence will begin at 4:45pm in the President's Lounge and is open to the entire campus community. There we will count down to 5pm together at which time participants will finally be able to break their silence to discuss action steps to move forward as a community and ways we can together change the culture around alcohol for Hawks at SJU. We will hear from those who took the vow of silence as well as those who witnessed it and reflect on the impact alcohol has on our community. Will you join us on Tuesday, October 30th and let your silence stand for something? If you are struggling with a substance use disorder or are looking for support for yourself or a friend, please reach out to Wellness, Alcohol and Drug Education (WADE) at wade@sju.edu or stop into Campion 231. You can also contact the Wellness Educators for more resources at wellnesseducators@sju.edu or The Flock at flock@sju.edu.